I’ve been trying to do a regular catch up day of study with Amanda and some weeks I’ve done better at that (either in the actually meeting up or in the getting significant work done) than others. I figured a really easy place to start researching – easy in terms of being able to pick up and put down bite size pieces – was with the data collection. I’ve done a reasonably thorough scramble around our house to find all the Aussie SF (short fiction) we have as a starting point. At the moment, my sample set is going to be Aussie SF because it seems more doable and I’m probably going to be able to better, and more completely, source all the texts. And my thinking was, just work through the piles of mags, collections and anthols that we’ve got in the house as a starting point. The problem of course is, I’m not yet sure what and how I want to crunch data so I don’t quite know what and how to capture information. I don’t want to have to come back and get something else from all these titles later. And the way I collect all this data now is likely to affect what I can do with it later. It’s very circular. The other issue is, because I can only pick up and put down small bite size pieces, I never really get the chance to sit and think long and hard about it. Other than the thinking I did for the general objectives and broad methodology I outlined in my candidacy proposal. So this means that every time I do sit down to work, I get distracted by possible tangents to veer off on or rabbit holes to dive into. Though probably that would be the case even if I was sitting in an office on campus in silence for hours at a time too. Yesterday I sat down and managed to work on some old ASIMs. I’m looking at the gender breakdown of publications in SF in Australia, basically. Originally I was just looking at the fiction. Though I had also planned to look at other methods of performance evaluation ie years best round ups (both the fiction chosen and the way the editors view the year in their editorial round ups) and then also the various awards. These two will likely be more general SF rather than Aus SF in isolation (again because the sample set seems more doable). But along the way I realised that I will also need to look at other features in magazines such as the interviews (who conducts them and who do they interview) and also the reviews (again, who reviews whom). 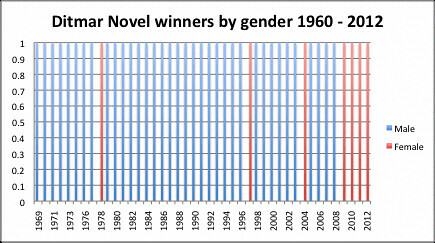 I’m interested in the way we rewrite and reframe the scene – women have always written SF and yet they mostly have also been written out of (or their roles downplayed in) the history. How does that happen? Looking at the books that get attention, the authors who are spoken about, held up as the finest or the core or the genre shapers of our field may give some hint to that. 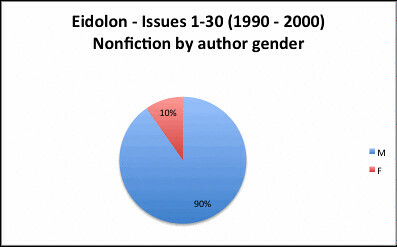 These are the authors we remember and these are the ones that become easy for everyone to then pull out if they suddenly need a list (try it in your head and then see how many women are on those lists). 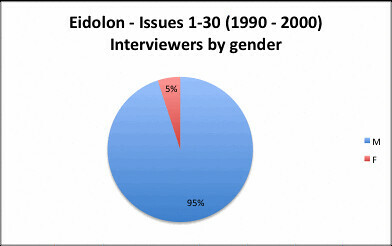 And I realised today, that along with looking at editorials for gender breakdown of who is most discussed or held in esteem, I also need to do the same within interviews and reviews, if necessary. It’s quite fascinating, and well, then quite angry making followed by downright depressing. But not anything we didn’t know or haven’t discussed before. All I’m doing is collecting the data to make the pretty pie charts later. I like to play games with it like, will the one woman mentioned be Ursula le Guin? And now I’ve got a list of Australian male writers too. I don’t have a sample set big enough yet for that one but I might have some breakdown on who those authors are at some point. My guess is that the Aussie women will be Sussex, Love and Lanagan but we shall see. 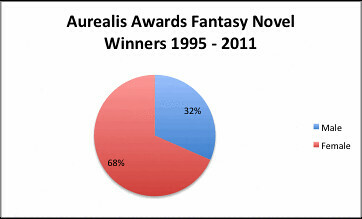 Before I move on, I wanted to dig a bit deeper into the stats I presented last time on the Aurealis Awards novels categories. 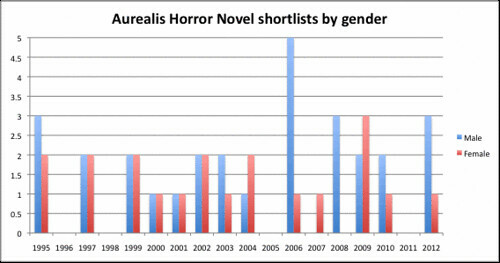 In my last post, I compared the gender of shortlisted authors and the winners in each of the Aurealis novel categories and then compared those to the gender breakdown of the Ditmar novel category. I wanted to look at that a bit more closely. 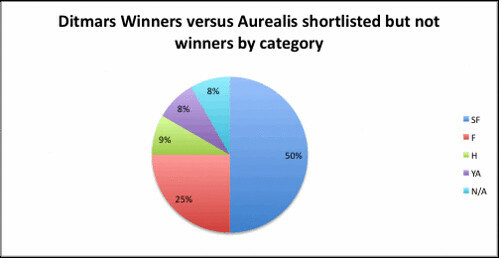 Here is the breakdown in Ditmar novel winners by whether they won, shortlisted or were overlooked in the Aurealis Awards novel categories. 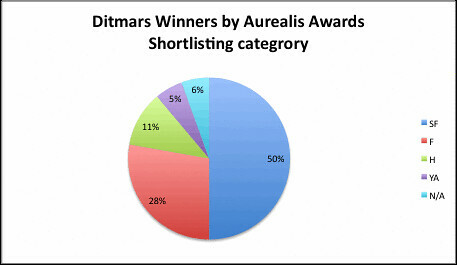 The Ditmars are often seen as a “correcting force” for the Aurealis Awards. 6% of the time, or once, a novel won the Ditmar which did not make the Aurealis Awards shortlists. That novel was The Scarlet Rider by Lucy Sussex. It is recognised in the subsequent charts as N/A for Aurealis Award category. 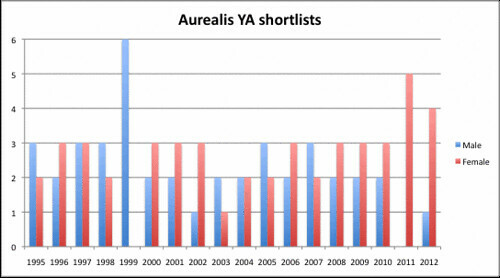 This chart breaks down the Ditmars novel winners into genre using their shortlisted categories in the Aurealis Awards (for the length of the Aurealis Awards, only). 50% of the time, a SF novel wins the Ditmar. Last year was the first time that SF novel was written by a woman – Kim Westwood’s The Courier’s New Bicycle. 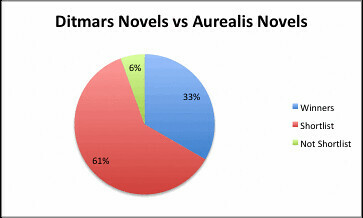 61% of the time, the Ditmar novel goes to a novel that only shortlisted, but did not win an Aurealis Award. Those winners are broken down below into genre category. The other aspect I wanted to drill down into was the Fantasy novel category. It was remarked to me after I posted the last statistics that it’s interesting because it’s not a new thing for this category to be a strong female – dare I write “dominated” – category. It’s essentially the trend for this award. This starts out with some feel good, happy carefree plots but be prepared for the sobering finish. 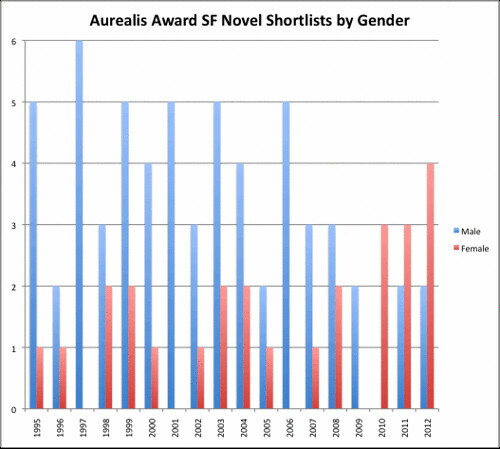 Looking at the gender breakdown of the Aurealis winners and shortlists over time. What I feel I still need to chase down here, if the information can be found, is what was eligible for consideration for the shortlists for each of these years to have a look at that gender breakdown. But here’s some fun facts for this category. 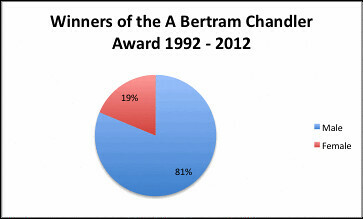 Over the course of this category award, there have been 19 wins to 13 individuals: 4 women and 9 men. The 4 women are Marianne de Pierres, Kim Westwood, Maxine McArthur and Kate Orman and they each won this award once. 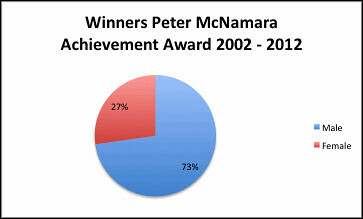 5 men have won this award more than once: K A Bedford (2), Damien Broderick (3), Sean Williams (2), Sean McMullen (2) and Greg Egan (2 – though he declined the second). 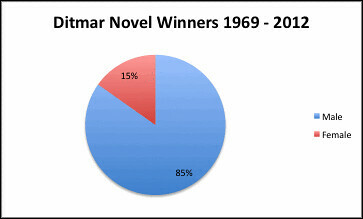 And finally, I thought it would be interesting to compare the above with the Ditmar novel category. 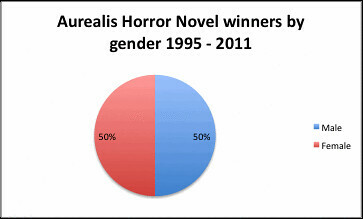 Now, this is a pretty shocking pie chart. I think it presents case in point, Tansy’s Theory that as soon as you ask people to narrow their choice down to one, you [mostly] get a male winner. That 15% female winners, equates to 7 compared to 39 male winners: Cherry Wilder in 1978, Lucy Sussex in 1997, K J Bishop in 2004 and then Margo Lanagan (2009), Kaaron Warren (2010), Tansy Rayner Roberts (2011) and Kim Westwood (2012). 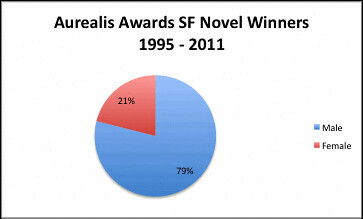 I need to do a proper comparison, but it feels like in most years, the SF novel beats out the Fantasy or YA to win the Ditmar. 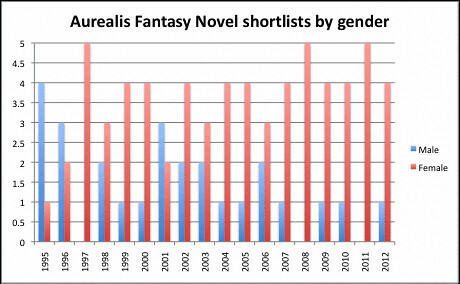 The other thing of note, is that the fantasy Aurealis category has some strong female novelists who appear multiple years on the shortlists and often have won several. These include Juliet Marillier, Sara Douglass, Glenda Larke, Marianne de Pierres, Isobelle Carmody. All these awards represent narrowing the winner choice down to one person. The most interesting here is the Peter McNamara Convenors’ award, given the novel category gender breakdowns above. Just a short one today – The Kitschies. The Kitschies are new awards, established in 2010 with the single Red Tentacle (novel) and subsequently gradually adding the Golden Tentacle (Debut novel), the Inky Tentacle (Cover art) and the Black Tentacle (Judges’ discretion). Important things to know about The Kitschies are that they are presented by Kraken Rum and “reward the year’s most progressive, intelligent and entertaining works that contain elements of the speculative or fantastic.” The mission of the The Kitschies is “encouraging and elevating the tone of the discussion of genre literature in its many forms.” And the most important thing about these are the prizes – £2,000 in prize money and hand-crafted Tentacle trophies! Here are the stats. 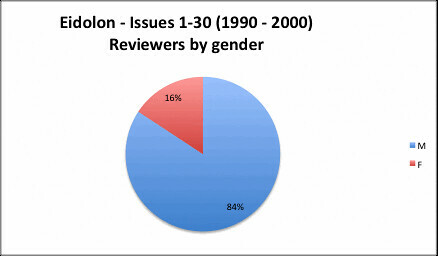 I’ve only presented two charts here. The first chart is the gender breakdown of winners with 12 winners across 4 years, and excluding two of the Judges discretion awards at this time – SelfMadeHero (which does have a female publisher) and the World SF Blog. 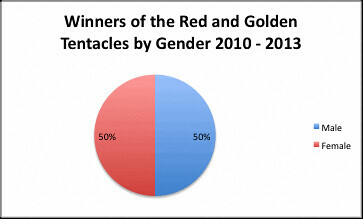 And the gender breakdown of the Red and Golden Tentacles ie the fiction component only.